OK, the rap on nondairy mashed potatoes is they don't have much flavor. Here, cut up 5 cloves of garlic, and half a cup of nondairy margarine. Microwave them together. The garlic pervades the margarine. This is a good thing. The other rap on mashed potatoes is they get old and blah. So, wait to mash them until just before serving. Peel (alas) cut into chunks and boil the potatoes in very salted water around 20 minutes or until done. Keep warm until just before serving. Melt the margarine with the garlic in it. Add the coconut milk, get it warm. 5 minutes before serving, mash the potatoes with the margarine/coconut milk/garlic. Add at least 1 teaspoon of salt. Gravy -- rice flour works instead of regular flour, but be sure and cook it at least 5 minutes. I don't recommend potato starch or tapioca starch, makes a gummy mess. Mix everything except walnuts in sauce pan. Boil until they're cooked and all the cranberries explode. Abut 15 minutes. Cool, add walnuts. This was pretty delicious, but if you like regular cranberry sauce or jelly, stick with what you like. It pretty much never has gluten or dairy. Green beans - see elsewhere in this blog. 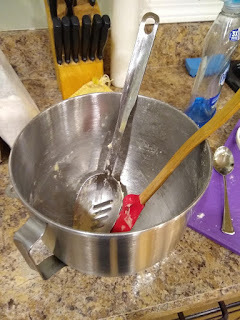 Pecan and Apple pies - Joy of Cooking with gluten free crusts, which if they aren't in this blog, deserve their own post.